The very heart of our beginnings comes first and foremost from the Gospel. In a certain sense, our spirituality is the Gospel spirituality practiced by the Most Blessed Virgin herself. The formal directive of our Foundress is that: “The Sisters shall imitate the life of the Blessed Virgin Mary based on what is written in the Gospels.”1. Saint Joan’s perception is very enlightened: she did not emphasize any particular dimension of Jesus or Mary’s life, any particular mystery, but instead she took the entire Gospel, the whole life of Jesus and His Mother. St. Joan never separates Jesus from Mary. Her animated Marian devotion positioned Mary in a perspective of faith there where was her proper place. In the Rule it’ll be a matter of doing “everything for the honor of God and His Mother Mary.”4. Mary was a perfect young Jewish girl of her times. She became the first Christian; she did not choose anything particular out of her Son’s message, but she lived intensely for the Father, the Son, and the Spirit. On this precisely rests the richness of our Rule. As long as the Gospels is existent our spirituality will be existent, too! A law, to which we must attune ourselves, does not determine our life, but it is a “life” that streams out of us. Each one of us, in her own way, has to reflect the image of the Blessed Virgin. Today’s young people are very sensitive to it; it is very obvious in the novitiate. When St. Joan says: “May those who see them see also Virgin Mary still living in this world” she realizes that these are unique and audacious words, but this is the audacity of the Spirit who, even today, is able to fill up hearts and give meaning to our life. Living out Mary’s life cannot be improvised and thus Joan traces a road for us. And in doing so, she is very precise: her road of imitation is not left to our judgment or our devotion – no matter how great it may be – it is the imitation of the 10 evangelical virtues of Mary. Ten is not a reducing figure, but simply the number of times that the Gospels speak of the Virgin Mary. This is not a question of an exterior imitation, but of conformity of the heart. To arrive at that “conformity,” St. Joan recommends that we follow the ten virtues of the Blessed Virgin: purity, prudence, humility, faith, devotion, obedience, poverty, patience, mercy, and sorrow. She also recommends for us a more profound meditation on the Lord’s Passion, to listen to the Word of God and lead a fervent Eucharistic life. These three “devotions” to Jesus, weren’t they first the very devotions of the Blessed Virgin, just like she herself revealed them to St. Joan? These are the great pillars which, combined with practicing the virtues, will help us in conforming ourselves to God’s will. Because the Holy Spirit alone can make our heart conform to the Blessed Virgin’s heart. Mary is the way that will lead us to living always under the action of the Spirit. Mary in everything, alive in our life, for Christ’s pleasure, to flow forth secretly from our communities as a Marian grace: a vision of peace that wants to pour itself on the whole of humanity through us. 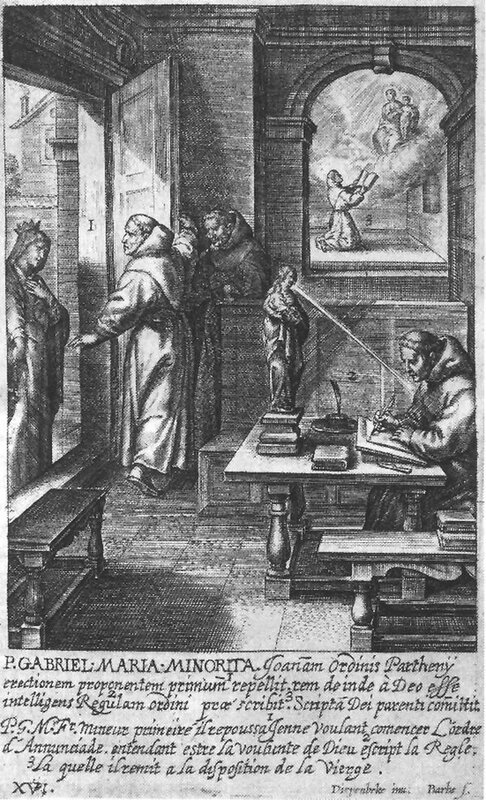 Father Gabriel Maria, OFM, inspired by the Blessed Virgin Mary, writes the Rule of the Ten Virtues – as symbolically depicted by an old drawing. First and above all keep the Blessed Virgin constantly before your eyes, directing to her your thoughts and your gaze just like the magi gazed upon the star. May the Blessed Virgin be your model, your oracle, your Rule. May you have no other task but to please perfectly your Bridegroom through the imitation of the Blessed Virgin. In fact, your prudence, counsel, devotion and goal are to please God sincerely through the Blessed Virgin. But, since the way of imitating Mary and pleasing God after her example contained in your Rule is entirely borrowed from the Gospels, you need to know what the Gospels say about Mary: the virtues that she had, her thoughts, words and actions. Indeed, in those four ways the Gospels present the Blessed Virgin for us to study and imitate and, if we discern and follow them we will have life eternal. Know, my dear daughters, and always remember that in spite of the Blessed Virgin being filled with all graces and virtues, the Holy Spirit willed and made it to pass that the Evangelists only mentioned ten of them. The ten virtues that Mary possessed according to the Gospels, you also must possess. And everything that we read about what Mary thought, said and did by her movement you also must think, say and do. Thus, practicing each of these virtues, you must follow the Blessed Virgin in three ways: in your heart, your mouth and your actions; without any doubt, all perfection and true fulfillment of your Rule consist and is based on this. This too is timeless! … This is the Gospel. And a modern-day saint, John Paul II also tells us: “the entire fruitfulness of the religious life depends on the quality of fraternal life.”. And there also lies the strength of our Rule. Charity leads us on the straight path to the vision of peace that our Founders had. Isn’t this vision in these present times rather a bit profound and actually painful? Mother Mary of St. Francis was a teacher of peace, she awakened in the Sisters a spirit of peace: always defending those, of whom an ill word was spoken, she never tolerated gossip. From the very beginning of our community’s existence, there existed a Third Order for lay persons, called “l’Ordre de la Paix” (Order of Peace), which today is named “Fraternité Annonciade: Chemin de la Paix” (Fraternity of the Annunciade: The Way of Peace). This too is a spirituality for all times! Saint Joan with a singular care turned attention to giving praise to God, to joy, by which a Sister should find by giving praise to the Lord: “the wisdom of all wisdom is knowing how to give praise to God.” Being an expression of love, praises are inseparable from mercy or, in a more general sense, from spiritually pure and tender love, which St. Joan so much maintained. She personally lived out this mercy under every form and ceaselessly recommended it to Sisters. Mutual forgiveness, fraternal charitable love, tender regard for those in suffering, commitment to the poor and the sick: “It has been always suggested to me in spirit that this Order should be founded more on the base of a pure and tender spiritual love than on corporal austerity.”7 And she adds: “May the Sisters be united in charitable love because this virtue makes one more similar to Christ and Mary than any other one.”8 Indeed, didn’t St. Joan receive this instruction directly from the Blessed Virgin, as reported by Fr. Gabriel Maria: “You shall seek to establish peace between those people among whom you shall live”? Saint Joan offers us a road, which has nothing abstract, nothing to make us concentrate on ourselves but to turn totally to God, to please God. Livings to do God’s will is something that gladdens the soul and is inscribed in its very depth. And it always demands that we take our eyes off ourselves and direct them to God. I don’t force myself to be humble for the sake of humility nor obedient for the only purpose of being good. I do so because I know that Mary was able to please our Lord in this very manner and that my only wish is to please Him, also; to become His joy! Father Jacobs also reminds us: “Saint Joan was called to follow the ten virtues, that is to a complete offering of self to Mary. To this she also called her Sisters.” She even requested to be called Marienne! According to John Paul II, “A Marian spirituality is the spirituality of complete intimacy with Christ.” This is exactly what the spirituality of the Annunciade is in its essence. The Marian charism of St. Joan of France, which we love so much, is entrusted to us so that we pass it onto the entire Church! Statue of the BVM from the convent of the Annunciades in Thiais. The words of our Founders have great power! They alone would suffice to give us confidence. Numerous wars, the time of revolution nearly annihilated our Order… “I am quite certain that your Order will last until the end of the world, if you yourselves do not abandon it,” (wrote Fr. Gabriel Maria). So it survives! After returning from exile in England, we had the convent in Villeneuve sur Lot. But Thiais began in an unbelievable way, with only four nuns…(one of whom – Sister St. Martha – was very ill. 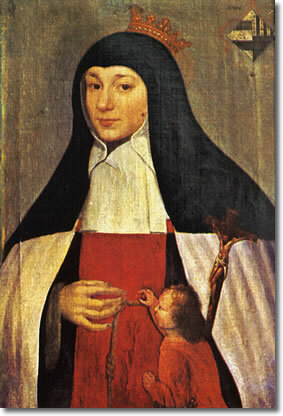 Her miraculous healing, through the intercession of St. Joan, was beneficial during the process of canonization). First, a return to Perschray, in the jurisdiction of Sarthe, then we spent several years in Paris with a benefactress we finally came to Thiais, to the “Rose House,” under the direction of Mother Ancelle, who today is nearly blind, and would never see with her own eyes the new home at Grignon. Humanly speaking, all was inconceivable! Mother Mary of St. Francis established three foundations, re-established one at Villeneuve, and was the inspiration of the foundation in Menton! She did not know Poland… but, could she not have intuited the need for this as well? The Annunciade rouses itself after stormy times. History fills us with confidence! Throughout all of the Scriptures the Divine pedagogy remains the same: saving mankind. Salvation history is marked by trials. Look at the history of Israel, which is set free from Egyptian slavery by having to pass through the Red Sea and the trial of forty years in the desert. God has to purify His People… The key trial of the desert was necessary for the People to meet their God. So many trials… But God is not the God of the dead, but of the living. The same in the Gospels: Jesus goes through the Cross. We know well, that the Cross-is the wisdom of Life. In recent times, the Marian spirituality of the Annunciades has been confirmed by the Magisterium of the Church. In the eighth chapter, Vatican II’s dogmatic constitution on the Church Lumen Gentium, speaks of the life of Mary as shown in the Gospels, which appears as a synthesis of the Marian way described by the Rule of the Order of the Annunciade. This chapter presents Mary as a model for the Church, as a mirror that reflects the mystery of its life and holiness, and as a guide that leads the faithful to a proper understanding of the mystery of Christ. As if paralleling the Prologue of our Order’s Rule: “Firstly, and above all other things, have the Blessed Virgin continuously before your eyes. […] May she be your model […] and may you have no other task than to please perfectly your Spouse by imitating the Blessed Virgin” (Rule of the Order of the Blessed Virgin Mary, Ed. in Thiais (F), 1934; Prologue, No. 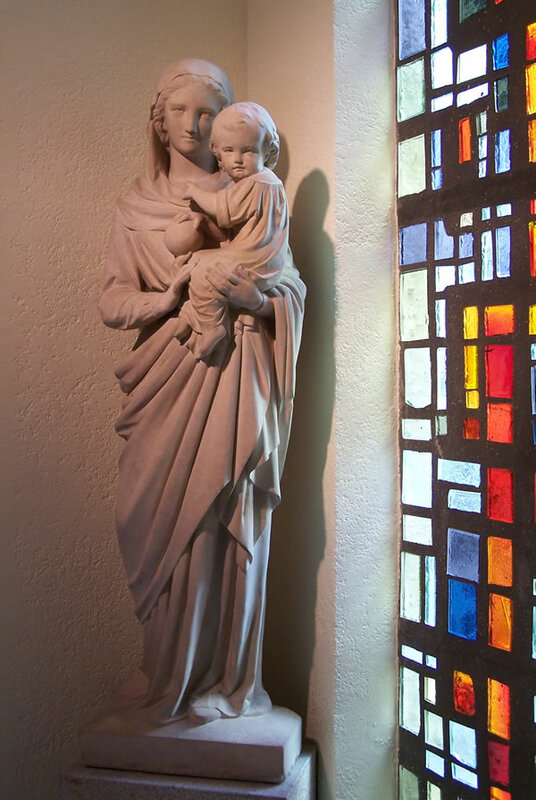 2), the Council invites the faithful to lift “their eyes to Mary – the model of all virtues,” while specifying: “Piously meditating on her and contemplating her in the light of the Word made man, the Church with reverence enters more intimately into the great mystery of the Incarnation and becomes more and more like her Spouse” (LG 65, cf. LG 67). Being rooted in the Gospels is a sure means to understanding Mary properly. It is the only means indicated by the Founders of the Annunciade: “Since the manner of imitating the Blessed Virgin and pleasing God in her image, which is written in this Rule, is captured entirely from the Gospels, you have an obligation to know what the Gospels say about the Virgin…” (Rule of the Order of the Blessed Virgin Mary, Ed. in Thiais (F), 1934; Prologue, No. 3). In his Apostolic Exhortation of 1974 Marialis CultusPope Paul VI emphasizes the need for a scriptural basis in a devotion to the Blessed Virgin Mary: “Today it is recognized as a general need of Christian piety that every form of worship should have a biblical imprint” (No. 30). Besides, in addressing in this same exhortation the example of the Blessed Virgin, Paul VI speaks of yet another aspect of the Marian cult — Mary as an example for teachers: “Mary, being the model for all the Church in giving God worship, is truly a teacher of piety for individual Christians. […] But Mary is above all the example of that worship that consists in making one’s life an offering to God. Saint Joan would have said — God’s pleasure! In another place, the Pope adds: “This will also bring the faithful to a deeper realization of the brotherhood which unites all of them as sons and daughters of the Virgin Mary, „who with a mother’s love has cooperated in their rebirth and spiritual formation,” (No.28). The theme of Mary as model and Mary as teacher is largely present in the teachings of John Paul II. “Mary is thus present in the mystery of the Church as a model. But the Church’s mystery also consists in generating people to a new and immortal life: this is her motherhood in the Holy Spirit. And here Mary is not only the model and figure of the Church; she is much more. For, „with maternal love she cooperates in the birth and development” of the sons and daughters of Mother Church” (Redemptoris Mater, No 44). How close of an example of such a life was given by John Paul II. How explicitly the mystery of the Resurrection was seen in him. We watched how deeply he entered into the suffering and we saw the whole world stand by his side. His funeral was a great ceremony reminding us more of a canonization rather than grieving moment. 2 The French original says there: “ceux et celles” thus signifying men and women.